The N.C. Chronicles. : 7 Traits of a Male Feminist and his self destructive ideal. 7 Traits of a Male Feminist and his self destructive ideal. I found it to be an interesting read, funny, it passes the time. 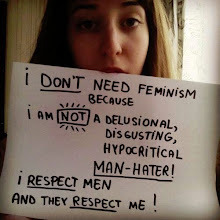 Plus it does have a foundation of truth of the male feminist or better known as the mangina. You know what the funny part in all this is? Lots of big bad criminals out there, so a big bad male cop is needed. Lots of big bad armies out there......so a big bad soldier is needed. They will never impose their idealism on us, they will push to far, we will eventually put a stop to it, after all, don't bite the hand that feeds ya, but the damn irony of it all...Man, that's borderline stupidity.